So what is a toner?…..
Toners are used to alter or enhance the desired tone of the hair. 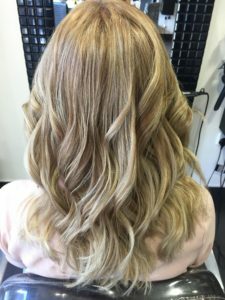 For example if you wanted your blonde highlights to reflect a grey, gold , beige or violet, pink or whatever colour you prefer then your hairdresser will use a toner after your hi-lights have been lifted to achieve this. They do gradually wash out as theses colours are generally semi-permanent. 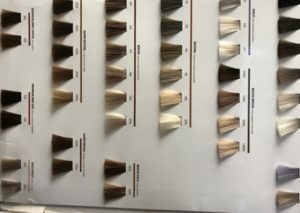 at Caprio’s we use Matrix Colours (L’Oreal Sister company), their toners are formulated to last between 4-12washes. The longjevity of a toner depends on the condition of your hair and which shampoo you’re using. 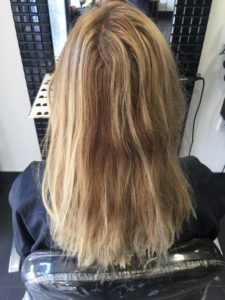 Blonde hair is quite high maintenance, so if you’re thinking of going lighter then you need to take into consideration that you will be visiting the salon more regularly to maintain the colour, whether its for a root re-touch or a toner in between colour services to freshen and clean the blonde through. Although toners are formulated to gradually wash out don’t under estimate their power. This image shows how effective a toner can be. This guests hair wasn’t lightened at all during this visit to the salon. She’d returned from a lovely holiday. Being on holiday means we tend to wash our hair more regularly, what with that and the effects from the sun the hair was in need of a bit of TLC. Our Salon Apprentice , Jade was responsible for this colour transformation for a college assessment. She had to identify what tone the guest wanted and what she had to use in order to achieve it. With a huge selection of toners available from the Matrix pallet this requires knowledge and experience, both of which Jade had obtained from hours of theory and practical training. As I’m sure you’ll agree she did a great job of cleaning the brassy tones out of the hair and giving the whole head of hair a lighter fresher more appealing tone simply by applying an all over toner……..oh and in case you were wondering……she passed her assessment. Well Done Jade! After blow drying the hair Jade used the Platinum ghd styler to create soft natural tousles.